I love to talk books. I can’t think of a time in my entire life when I haven’t been reading a book or three. Right now I’m reading a unique and delightful one called Cider With Rosie, recommended by a dear friend in northern Scotland. What else would you choose? Tell about one (or more) of the books you would pick, and why. 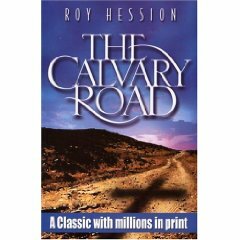 One of my choices would be The Calvary Road by Roy Hession. It was recommended to my husband and me years ago by a godly friend. Michael and I read it out loud together, slowly. We both wept our way through the pages. And it changed our lives. It’s one of those books that needs to be read and reread every year. I’m at a place in my life where I need a balm and a true course, and I think it’s time for me to read it again. Even one of my favorite ministries, Community Bible Study, puts this book on their recommended reading list every single year. CBS’s executive director reads The Calvary Road each January, to help set her course for the coming year. I have other books I would choose, and I will post about those another time. If you’re reading this today, won’t you share with us what your choices would be? What books have made you laugh, given you hope, changed the course of your life, delivered new insight, made you dream? What books would feed your soul if you could read only those for the rest of your life? I look forward to your answers. And this sounds like a good time for another blog giveaway. I will send a copy of The Calvary Road to every person who comments on this post. I, like you, enjoy reading so much. It is just recently I have been able to start up reading something other than a text book. I am currently reading “A prayer for Owen Meany” by John Irving and I am also reading “The Poisonwood Bible” by Barbara Kingsolver, both gifts from my daughter, Shannon. I have also read recently, also a loan from my daughter, “The Red Tent” by Anita Diamont that was a different take on the story of Dinah, Jacob’s daughter. It was good and gave one pause to think about the story and the culture of that day. I wish I could have more time to read :)! wow julie…choosing a favorite book is a bit like choosing a favorite child. I may find one tender and endearing, another motivational, and another may cause me to split a side with laughter. Also, I tend to read by author…when I find a book I like, I’ll read everything that author has written. One Recent favorite is Khaled Hosseini who wrote The Kite Runner and A Thousand Splendid Suns. Both grabbed me by the heartstrings. Perhaps the most life changing book I have ever read (Bible Aside, of course)is (and I know this sounds cliche) A Purpose Driven Life by Rick Warren. The message is so simple and yet so complex. I read it about three years ago and am still daily effected by what I read. I remember loving Peace Like a River by Leif Enger. I would like to re-read the Zion Chronicles by Bodie Thoene. I read them about 20 years ago and they thrilled me then. I wonder how much my taste in books has changed in those years. Ok…feels like I’ve written a book of my own here…Thank you for all the great book recommendations over the past 4 years. You haven’t led me to a stinker yet. I could read Gone With The Wind a million times and never tire of it. I also love Jane Eyre, Rebecca, A Tree Grows in Brooklyn, The Narnia Chronicles, Till We Have Faces, Agatha Christie, Vanity Fair, Alias Grace, and all Roald Dahl. I also enjoy reading plays…something I have to do alot of anyways….and I love Tennessee Williams, Eugene O’Neill, Lillian Hellman, among others. I just finished reading Angela’s Ashes for the first time and I really loved it. Wow! This was a tough one, Julie. I’ve read so many books these past 25 years. Some I can’t even remember the name of. Others have had characters that “came to life” on the pages and continue to live on in my memory. Many were highly entertaining. Some I would never recommend to my friends(or my enemies!). But if I were to choose only 5 books to read for the REST of my life, then these five must have something special about them…something life-changing and/or filled with timeless truths. Like you, my Bible would be the first book I would choose. Since I was a young teenager, it has taught me, rebuked me and continued to change me into someone who is radically different from the Carey who was once a wretched 14-year old sinner. It continues daily to speak to my heart and soul, even though I’m nearly 50 and still a sinner! The devotional, My Utmost for His Highest by Oswald Chambers would have to be my second choice. I received a copy of this when I was 18-years old and a fairly new Christian. I read it from cover to cover while I was living as an AFS student in Bangkok. Even though Chambers used language and spoke truths that were WAY beyond my understanding, it planted a deep hunger in my heart for the things of God. Since then, I’ve read it through numerous times and have had to replace worn out copies with new ones. It continues to be the best devotional I’ve ever owned. Next on the list, The Pursuit of God by A.W. Tozer. It may sound melodramatic, but this small book opened my eyes to a God I never knew existed…a God that could truly be known, just as you and I know one another! What a thought! Last book(s)on the list – a set of the Chronicles of Narnia by C.S.Lewis. I’ve read these countless times, but each time I read them, I find myself trasported back back to very familiar Narnian turf and into another great adventure! Wow Julie…my top five? Impossible to name the top five. I love all books, even just the feel of them in my hands. Your question spurred me on to look at a few I haven’t spent time with recently. A couple devotionals I enjoy are Women of the Bible by Spangler and Syswerda and Come Away My Beloved by Frances Roberts, which is intense, deep, amazing…. I also like The Return of the Prodigal Son by Henri Nouwen, The Book of God (The Bible as a Novel)by….Wargin??? Charles Swindoll’s books on figures from the Bible (Job, Joseph etc.) are good too. And really, let’s be honest. I love good crime fiction. It’s in my blood. No pun intended.